The Ricoh IM C3000 Color Laser Multifunction Printer not only comes with smart features, but it’s also scalable. Meaning if your business grows or changes and you need different features, you can upgrade things on your MFP to make this possible. This copier produces 30 pages per minute, whether you’re printing color or black-and-white documents. The Ricoh IM C3000 Color Laser MFP allows for you to produce presentations, brochures, postcards, and more. You can personalize the way you work with the added features of the touch screen and apps. 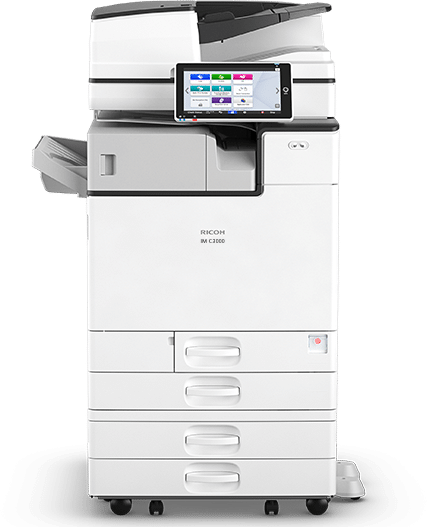 This Ricoh copier lets you download software, cloud services, and third-party apps, so users can work faster, smarter and more securely. Best of all, you can do it without a technician. You can reduce maintenance with the Ricoh Intelligent Support wizard. This helps your copier stay running longer and reduces your down time dramatically. You no longer have to wait for a technician to come and fix it for you. You can follow the prompts and do what you need to get it done much more quickly.